The synergy of anti-aging Active Ingredients that Work™ are what make our NEW retinol complex an exceptional formula that stands out from all others. A super generous 3% concentration of pure Retinol, encapsulated for liposomal time-delivery, is combined with clinically-proven Matrixyl™ peptides, pure bioactive Vitamin A and a non-acid resurfacing Glucosamine sugar complex. This powerful combination combines to firm and resurface skin without the irritation of most retinol products. What else? You can look forward to increased collagen and elastin production, enhanced skin barrier function, and a younger, smoother texture to your skin. Retinol is the #1 dermatologist-recommended anti-aging ingredient as a necessary addition to any effective anti-aging skincare routine. If you can’t tolerate Retin-A, this formula with its high concentration of Retinol will deliver excellent results. As one of the very best retinol formulas available, CSRx Retinol Peptide Resurfacing Complex features intelligent time-release technology and airless pump packaging to keep ingredients lab-fresh. A product with just 1% retinol is comparable to a prescription retinoid (Renova, Retin-A)with 0.02 tretinoin. Clinical trials have proven that retinol combined with peptides can reduce surface wrinkling by as much as 68% within 2 to 6 months, depending on skin type. 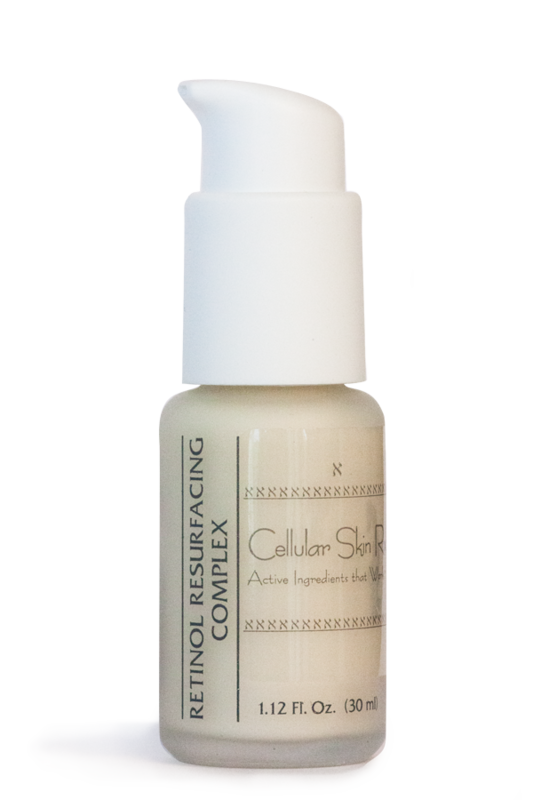 CSRx Retinol Peptide Resurfacing Complex should be used exclusively at night. Combine with vitamin C+ Firming serum each morning for even better results. Always remember to use a daily sunscreen to protect newly-revealed skin cells. Please allow extra time for delivery of large custom size. Apply each night to clean skin. May be applied around eyes and lips. If you have sensitive skin, start off using every other night then after two weeks, progress to nightly use. Always use daily sunscreen to protect newly-revealed skin cells. Water, glycerin, cyclopentasiloxane, octyldodecanol, PPG12/SMDI copolymer, mica, butylene gylcol, dimethicone, laureth-4, saccharomyces extract, dipotassium glycyrrhizate, acrylamide, carbomer, sodium hyaluronate, green tea extract, tocopherol, ascorbyl laurate, ascorbic acid, isohexadecane, polysorbate 80, glycine soja, potassium hydroxide, citric acid, laureth-23, PEG-8, various preservatives. Alternate nightly use with vitamin C+ Firming serum or F*a*C*E Synergy serum or Age-Limit Advanced Refinishing serum for quicker results. Can use along with Firming Densifier Active Treatment Moisturizer. Wait 30 minutes before applying moisturizer. ALWAYS use daily sunscreen. Alternate with Age-Limit Advanced Refinishing serum if you use our Great Skin in Four Weeks kit.